Power Driven Diesel specializes in diesel performance and providing the diesel consumer information, innovation and value. Our products include delivery valves, injectors, turbos, compound turbo systems, transmissions, complete engine builds and even premium diesel engine oil and automatic transmission fluid. Co-owner of Power Driven Diesel and Turbo System Design Guru! 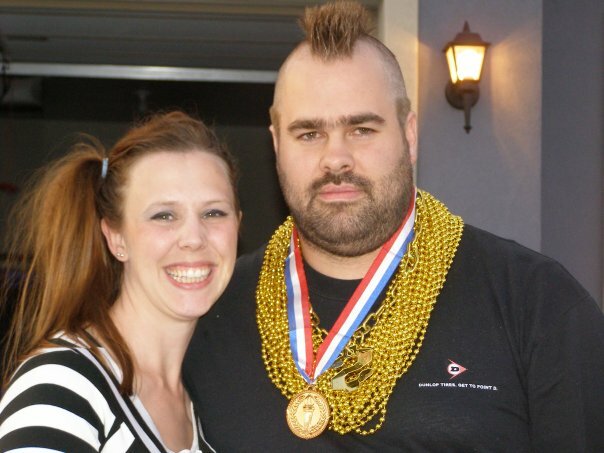 Todd Welch is a big horsepower enthusiast, and if you’ve ever met Todd you know when we say big we literally mean big. At 6’9” tall he is almost always the tallest person at any given race. For Todd performance comes first, it wasn’t until his truck ran in the 10’s that he decided tires on stock rims just weren’t wide enough. It is hard for Todd to spend money on pretty rims when a new turbo costs about the same price. Todd is an avid diesel drag racer. He hits as many races as is possible with his busy family life. You can often spot Todd out in a crowd, not only just because of his height but also because he often has his wife and 4 small kids with him at events too. His first race was in Frankenstein before it was “Frankenstein”. Back then it was a 5 speed single turbo work truck, and he was so excited to hit over 100mph. It was actually a decent accomplishment back then. After his second race he was hooked. That winter the 5 speed came out and a built automatic took its place. In his first full year of racing he ended up taking 4th place at the first ever NHRDA finals in the Super Street class. Todd’s diesel addiction started similar to most. He got a truck and started modding. The power a diesel engine is capable of was intoxicating. When he decided to make his first compound turbo system he spent a lot of time on the forums researching how to size the turbos. A lot of what he read seemed to be advice that lacked foundational figures. There was no concrete info that he could find that would allow him to properly engineer a turbo compound set. Todd loves research and accurate proven information, but most of all he loves having data backing it all up. In his mind there was no other option than sending his wife all the turbo textbook links from Amazon that he could find and suggesting these as quick and easy Christmas presents for himself! It was during this time of intense research that Todd crossed paths with Big Blue/Junker Drag truck/Will Terry. After many conversations with Will, Todd knew Will was into the actual data even more so than himself. He had finally found a real resource willing to share information and ideas! He poured through the textbooks Santa had dropped off and finally found the data and research he needed to give him the confidence to design his own system. He kept in close contact with Will and then set to work for real life experience. The first turbo compound set he built was a performance towing set. He wanted to see how far he could push an hx35 in a compound set up. He utilized a water to air intercooler between stages and used the normal air to air after cooler. With this set towing was a breeze. When he hit a hill EGT would climb a bit then the boost came on and the EGT would drop while going up the hill! This same set hit the dyno and did a bit over 800HP and ran 11’s at the track. A solid first effort proving everything he had read and implemented. After that, curiosity took hold and he proceeded to build many dual intercooled setups over the next few years. When you run the numbers and account for intercooler efficiencies it is amazing what can be done. That same truck has turned into what is now known as Frankenstein. It sports a dual intercooler triple turbo setup, and its last dyno was 1379HP. 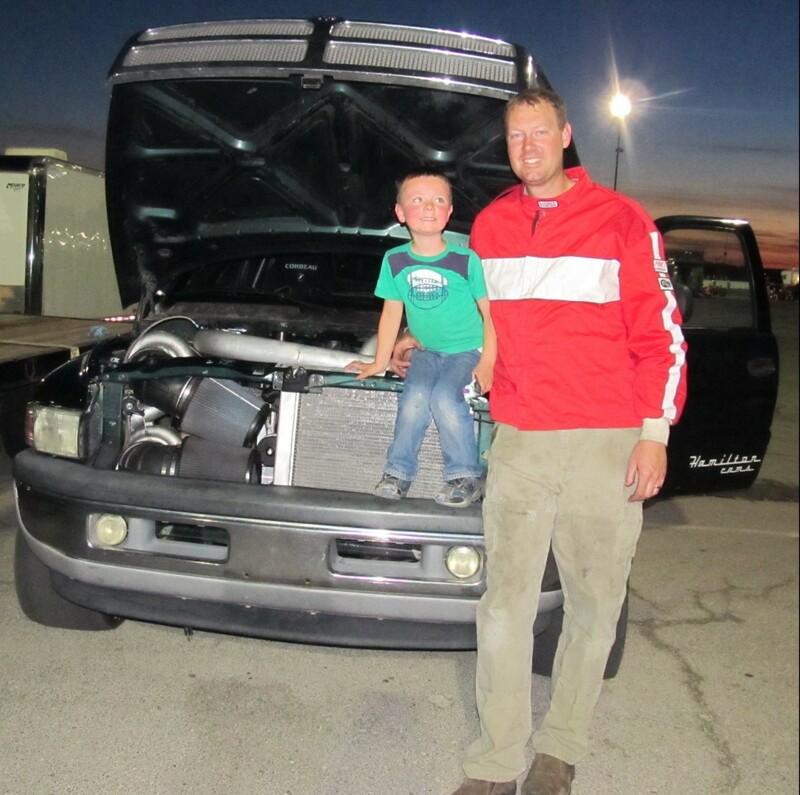 He has made some major improvements since then, and it is Todd’s goal to have a 1500HP street truck that he can drive around town, to the race track, down the dragstrip to win a trophy, and then drive home! In 2015 Todd and Will decided to join forces and continue on their quest to gain knowledge, share information, and provide solutions to an industry they had both grown to love. It is a big change for Todd as he has been the primary care giver to his 4 children for the past 7 years, but he is up for the challenge. With Will Terry and Lonnon Jensen, Todd’s long-time family friend and diesel enthusiast, Todd is excited to expand his skills all day long rather than just from 10pm to 2am! Co-owner of Power Driven Diesel, Fuel Injection and Transmission guru! After pioneering the cheap He351cw turbo swap and hitting a then impressive 499 HP on the dyno in his VP44 fueled 24V Cummins, Will took to drag racing. After burning up a few clutches trying to drag race his then 500 HP 24V Cummins, it became apparent that a second “race vehicle” equipped with an automatic transmission would be necessary. In 2009, Will purchased a beat-up 1995 Dodge Ram 2500 equipped with a 12 valve Cummins for a mere $1,500. His reputation for budget building quickly grew as he methodically turned his stock 12 valve Cummins into a test bed for diesel performance. He documented the build step by step with a build thread on an internet forum he frequently visited (http://www.competitiondiesel.com/forums/showthread.php?t=59175) This truck, aka the 95’ Junker Drag Truck became Will’s main hobby as he transformed the stock 160 HP 20 second truck into an 800+ HP drag truck capable of 10 second ¼ mile passes. Truck upgrade costs had to be kept low as Will had to provide for his small family on a meager salary during the big downturn in construction. Cheap performance upgrades were added using second-hand and modified stock parts along with the local drag strip to measure performance gains, with a focus on maximum horsepower per dollar. 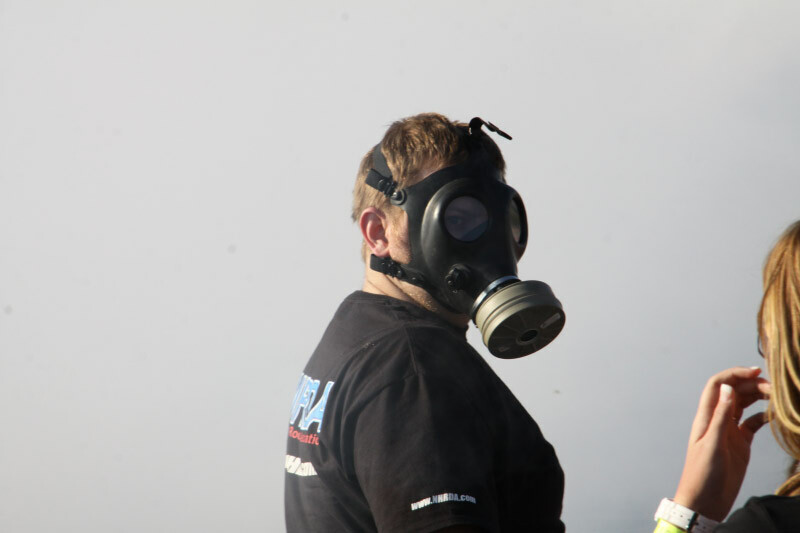 In 2011, during an NHRDA sanctioned burnout contest that completely filled the cab with tire smoke, Will got the brilliant idea that a gas mask would be a great investment for future tire torture contests. (https://www.youtube.com/watch?v=mN4Xeoix8ss) In every subsequent burnout contest since then, Will has sported the military grade gas mask, which has become his signature look. Will, with his passion for budget-friendly diesel performance coupled with a desire to test and tweak everything, continued to experiment with fuel delivery systems, fuel injectors, transmissions, and eventually compound turbo and engine design. Will’s path crossed Todd’s a few years back when Todd was building one of his Cummins powered race trucks and needed large fuel injectors. He and Todd quickly became friends as Todd too had a passion for testing, tuning, and drag racing. In 2015 Will & Todd joined forces and started Power Driven Diesel. It was a substantial career change for Will as he abandoned his previous occupation and bachelor’s degree in construction management to pursue his true passion, Diesel Performance. With full-time work effort devoted to diesel performance technology combined with the knowledge and passion of business partner Todd Welch, Will hopes to continue to gain knowledge and experience in addition to pushing the envelope of his Junker Drag Truck. Logistics, IT Manager, and Website Admin. 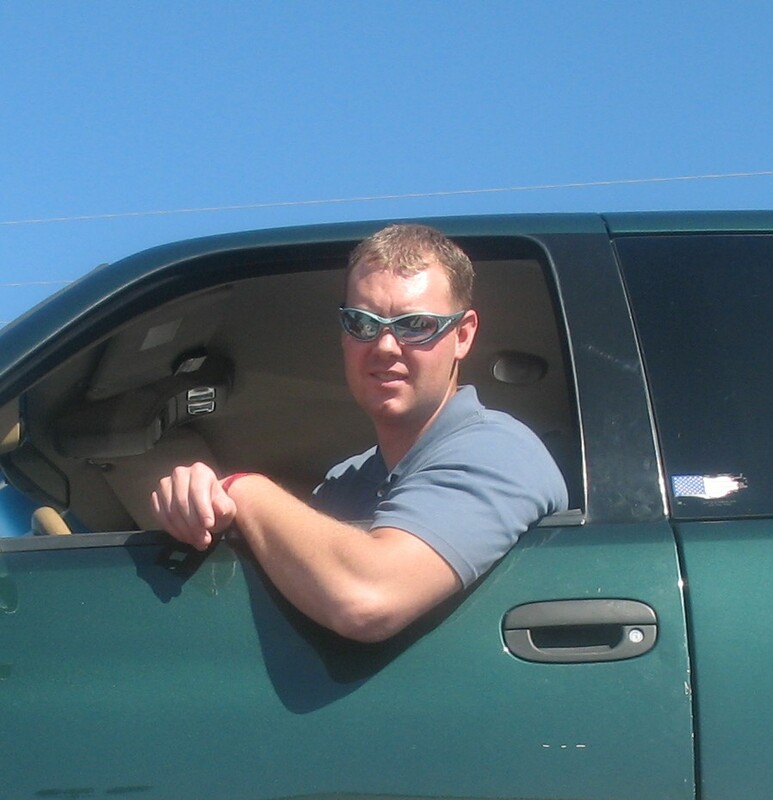 Lonnon Jensen has had a passionate interested in vehicles since he was 2 or 3 years old. His dad brought home two Suzuki 50 four wheelers which Lonnon used to chase dogs while riding them. Lonnon started wrenching around that same age. Most of the time he was just copying what his dad was doing. One memory is when he was about 3. He was watching his dad taking apart one of the new 50s, while he did it Lonnon took apart the other mimicking what his dad was doing without his dad realizing it.. His dad found out only when Lonnon asked for help to remove the head. This passion only grew as he got older to bigger things like messing with a Yamaha 350 warrior, and a lawn mower all in the name of more power. He progressed to working on cars around the age of 6 when he found a torx screwdriver and proceeded to remove every lens on the the family station-wagon just before church. By the age of 12 he was very mechanically inclined and enjoyed working on automobiles. Around this time is when he met Todd for the first time. Todd was Lonnon’s older brother’s best friend. In 1999 The family got their first diesel, a 1999 Ford F350 7.3l Powerstroke. The power behind the wheel was addicting. Yet, the next step was how to give it more power and make it go even faster. He has been hooked on diesels ever since. Eventually he ended up owning that truck and a 2000 Excursion 7.3l Powerstroke. He now owns a 1993 Dodge D250 Cummins extended cab that he has increased fuel via the fuel screw as well as putting on a straight pipe. He also has a 2001 VW TDI New Beetle that he is learning to tune via software available for his car. He has also done a mufflerectomy on it, and plans to install nozzles and a twin turbo setup. In 2003 in Lonnon’s mind, it was a logical progression to go from working on cars to building computers. He started building computers for himself because he found it was less expensive than buying a premade system. He quickly learned the software side of things because he was getting viruses and refused to pay someone else to do something he could learn to do himself. In 2007 he started working at Dell’s prosupport call center where he quickly realized he knew enough to repair computers on his own. This was confirmed when he could tell the customer exactly what was wrong and how to fix it before the computer could load up the answers to give the customers. He would have to keep them on the line just so his computer could catch up to what he had already accomplished. He also started playing with web design, setting up servers and learning other things to cut costs without cutting out quality in his home computer systems. With these talents he decided to start his own business. In 2011 he opened Any Computer Any Problem which lasted for 4 years when he decided to close up shop because he was offered a higher paying job. Lonnon continued to work on his diesel truck and bug as a fun hobby combining his computer and diesel knowledge when Todd approached him with his new business Power Driven Diesel. Of course he discussed it with his wife first, but once he had her blessing; he jumped at the chance to turn his passion into his profession. Who wouldn’t want to enjoy every day of their job doing what they love!